My first mental reaction to the media reporting the casualties from the 3.11 Japan earthquake amounts to more the 20,000 persons; the effect can be small if the casualties are spatially dispersed. Indeed, the quake was strongly felt in most of the eastern half of the country; but casualties hardly occurred from the shake itself but mostly from the tsunami that reached the Pacific coastlines 30 - 60 min after the earthquake. The casualties are concentrated in three prefectures of Iwate, Miyagi and Fukushima in Tohoku region and almost exclusively to coastal municipalities (see Figure left). 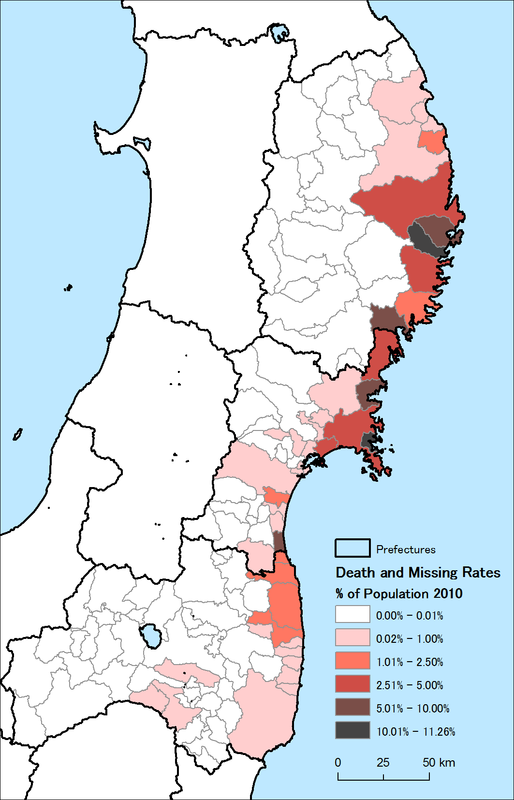 The largest dead and missing persons combined (as of March 29, 2011) is Ishinomaki City (4,926 persons) followed by Rikuzen-Takata City, Kesen-numa City and Higashi-Matsushima City (around 2,000 persons each). Ishinomaki City, the second largest city in Miyagi, were especially hard hit because the city’s economy is based on Ishinomaki Port for fishery and fish processing industry and its densely populated area is very close to the coast. My second attempt to make believe the effect could be small; the municipal death toll is large because the population is large. The attempt can be shown as failure by dividing the death figures by the municipal population from the 2010 Population Census (see Figure right). The highest rate of dead and missing persons is recorded in Onagawa Town (11.3%) followed by Otsuchi Town and Rikuzen-Takata City (both around 10%). All of these municipalities and other municipalities along the Sanriku coast, a ria coast, has been well known for their hazards to tsunami because of their coastal shape; they received damaging tsunami waves from the earthquakes of the immediate vicinity (in 1933, 1896 and 869 ) and that of the antipode (1960 Great Chilean Earthquake). Counter measures were in place, such as Taro Town ‘s (Miyako City) coastal levee of 10 m high and 2.5 km long and Kamaishi City’s caisson breakwater of 6 m high and -63 m depth placed at the mouth of Kamaishi bay; however, the size of tsunami this time was unprecedented. The rates of dead and missing persons exceeded 5% in many of these municipalities in ria inlets. 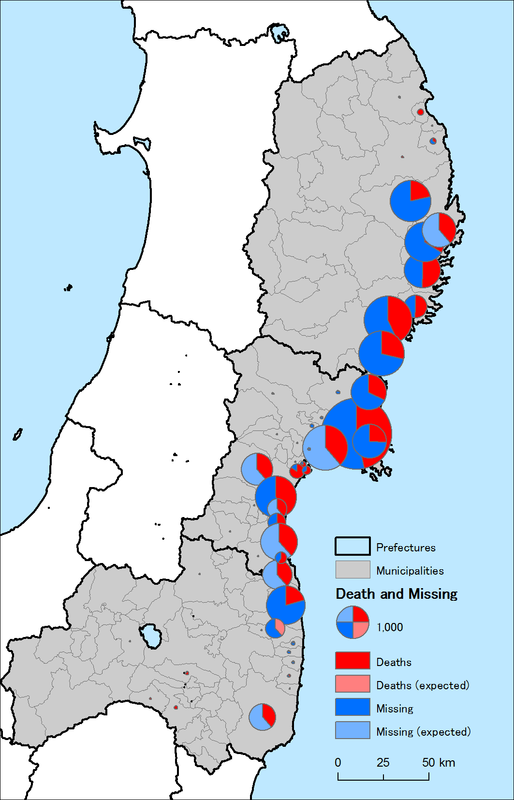 The East Japan Earthquake Disaster affected large area, but death tolls concentrated in municipalities along the Pacific coast of the Tohoku region. Recovery of such municipalities would take many years as substantial proportion of their population is lost by the tsunami. Sources: Iwate and Miyagi Prefectures, Fukushima Prefectural Police, and 2010 Population Census.